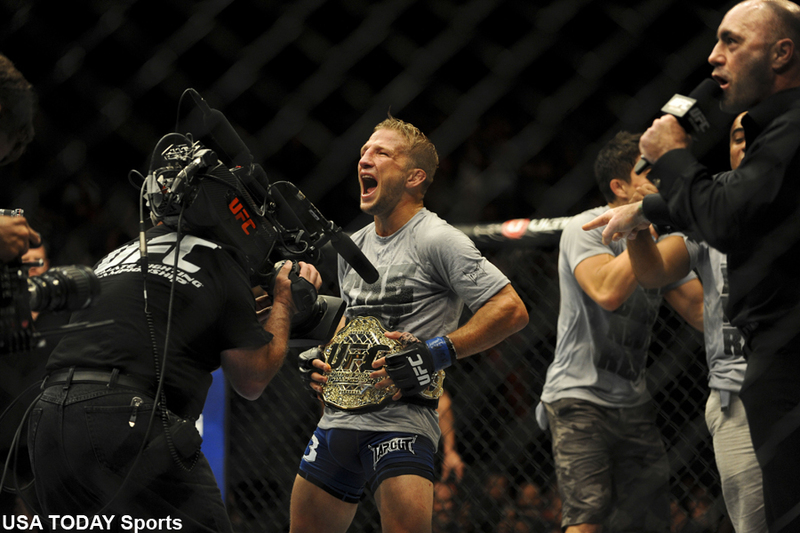 As Ric Flair famously stated, “To be the man, you have to beat the man.” Reigning UFC bantamweight champion TJ Dillashaw (pictured) will finally get the opportunity to beat Dominick Cruz – the man who never lost his bantamweight title, but was stripped of his belt due to his injury prone ways. UFC president Dana White announced Wednesday on “Fox Sports Live” that the planet’s top 135-pounders not named Ronda Rousey will meet January 17 on Fox Sports 1. The scrap will follow the NFL’s NFC Divisional game on FOX. Cruz is perfect through his past 11 fights, a torrid run he ignited in 2007. The problem is, “The Dominator” is hurt far more than healthy and the UFC was forced to take his belt away. Renan Barao eventually became the interim featherweight champion, then was promoted to the outright champ in 2014 after Cruz’s demotion. Much has changed in the bantamweight landscape since Cruz sat atop the throne. Dillashaw came out of nowhere to trounce Barao, who the UFC was heavily pushing as the game’s top pound-for-pound fighter prior to their initial meeting in May 2014. Dillashaw solidified his status as the division’s top dog – outside of Cruz, of course – by blasting Barao a second time the last time he took center stage in July. Cruz finally ended his three-year hiatus by knocking out Takeya Mizugaki in 61 seconds last September. He was granted an immediate shot at Dillashaw, but, as luck would have it, he blew out the ACL in his knee two months later and has been riding the pine ever since. No word on where the shootout will take place.